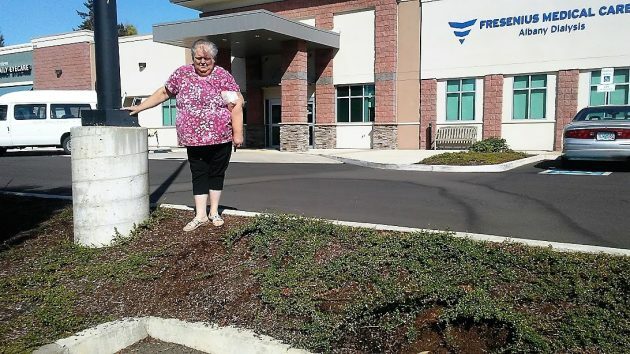 After her dialysis session Friday, Gayle Davis stands atop the two-foot berm that’s a difficult hurdle for her and other patients. Looking at the hundreds of spaces at the North Albany Village shopping center, you’d think parking is never a problem. But then you’re likely not one of the patients at Albany Dialysis, the local branch of the nationwide Fresenius medical company. The dialysis clinic was built on the east side of the shopping center in 2015. There are seven parking spaces in front, four of them marked for the disabled. When the seven are full, which I’m told is not uncommon at certain times, newly arriving patients can park in any of the other spaces farther away. 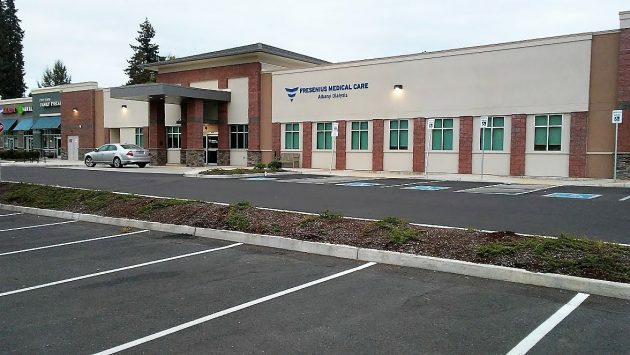 Their problem: There’s a landscaped berm, about two feet high, between them and the clinic’s door. Patients can climb up and down this berm, or they can walk around it. Neither option is easy for them. As Fresenius clinical manager Nicole McClure explained to me, some of her patients are elderly and many have medical problems, such as heart disease or COPD, in addition to their need for life-saving dialysis. And after five hours hooked up to the equipment, a period during which their internal organs are all working hard, these folks are wrung out and beat. “We can slip and break a bone,” said Gayle Davis, the patient who contacted me. She thought a gently inclined ramp connecting the two levels would solve the problem. And she showed me where a ramp could be installed. It would take up just one space on the lower level. Just before 5 on Aug. 29, parking was not an issue at all, as it appears hardly anyone was around. There aren’t enough bluespaces (sorry, my shorthand) for the clinic’s clientele. If the landlord can’t be persuaded to add the ramp, this could be an Eagle Scout project if the various regulators cooperate. Some clients can drive. Where our problem is some people have bad knees, hips. Standing and walking are hard but to sit we are fine. They check our blood pressure. If high or low, they cannot let use leave till it is in the safe zone. And yes, we all know about the medical transportation, and several use it. I personally drive. If I feel it is not safe, I call a family member. That is a significant problem that a person who did not deal with the situation regularly would never understand. I have a cousin, living elsewhere, who endures two types of cancer and kidney failure, and for whom most appointments for medical care are made more difficult by the tendency these days not to have parking spaces adjacent to buildings and near the doorways. Parking lots are reasonably close enough for the able-bodied, but the people most in need of care struggle to make it into the building, and then possibly walk some distance inside to their site for medical care. I appreciate your bringing this to our attention as well as contacting the owner of the property. I hope a solution can be found and implemented. Are Call-A-Ride drivers (they are a service that doesn’t charge a whole lot for a ride) allowed to help a person with a folding wheelchair and push them inside building to their appointment? You have to fill out some paperwork to belong to Call-A-Ride, but the paperwork only has to be filled out one time, and it is worth it. Should people that weak, tired, or sick be driving themselves? I would think they should be picked up and dropped off at the door. If friends or family are not available there are multiple options to get a ride these days. Bryan, if you are not a patient or do not know anyone that goes to dialysis you have no idea what you’re talking about. Yes, some can’t drive and have people pick them up, but there are also others like my dad and Gayle who CAN drive themselves. Comments like yours really set me off. I’m trying really hard to be civil. But really? They are not talking about the feeble and elderly here. Normal everyday people who just happened to need dialysis. They’re still capable of driving to and from. Sounds like an “attractive nuisance,” certain to cause pesky personal injury lawsuits in the future. The reason no one was about at 5 o-clock is because they were probably all done by 4 and are out of there. You come take a picture at 10 in the morning or 2 in the afternoon and you would probably see a totally full lot. Some folks are only there for 3 to 4 hours while some go as long as 5.5 hours. Nearly all only go 3 days a week but on the alternate days there is another complete set of patients that do those days. I go to the Lebanon clinic and go Tuesday Thursday and Saturday, while others go Monday Wednesday and Friday. And nearly all the chairs are full on the M,W&F shifts and most are full on the T,T&S shift. None of really enjoy the time we have to put in at the clinic and ease of access to our auto or other transportation is a small price to pay for anything that can make us feel better. The Albany clinic is really no different. There should be some breaks with pathways between the sides so people don’t have to chance falling over a curb or slipping on bark dust getting to or from the clinic. That was very poor planning on the designers part on that lot to put those spaces and curbs in there. Most of the folks that use that clinic are handicapped to some extent but those that can still drive shouldn’t have to go out of their way to get to or from the clinic. You said it. I have been saying this for awhile. Gale and I been putting the word out on Facebook and other places trying to find help on the parking lot problem in getting a walkway between the parking areas. When they put in a huge parking area, you would think they would have put in a walk path between the parking areas to get to the buildings, but this company that owns the parking lot did not think of that. Specially with a medical facility, there would be a walk path to help with patients walking to and from their vehicles carrying their medical needs with them. Walked the area this morning. First empty space was well-away from the door. Looks like there’s enough length to give a shallow slope to a ramp. Gayle Davis is standing on the Hickory side of the lamp. That might be wet in rain because of the lot slope. Slope seems better on the other side.